Start your new product demand forecasting process with this 7-step guide. Organizations need to regularly upgrade their products and launch new products to stay competitive and grow their businesses. However, a new product launch poses a totally new challenge – new product forecasting. 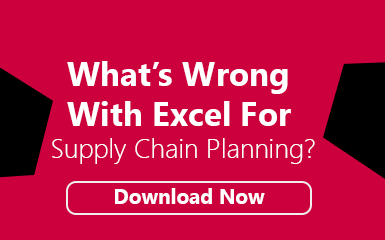 Due to the complexity of the demand forecasting process for new products, specialized Demand Planning tools need to be deployed for managing the entire process from the concept to launch phase. Outlined below are the major seven steps involved in Forecasting and Planning New Product Launches. This is the most important and challenging starting point of the process. New products have a limited history (or no history at all). This makes it impossible to apply historical sales data directly. Historical Sales data of similar existing products or products from the same category. Current Sales data of similar existing products offered by Competitors. The possible impact of Marketing activities like promotions, advertisements, coupons, pre-booking offers, etc. Possible effect of unique selling propositions based on the New Product Sales prediction. The timing of the New Product Launch considering seasonality –Christmas, New Year, Thanksgiving, Independence Day, Halloween, Summers, etc. Use the above considerations to predict new product demand by calculating the Demand for New Product for the first 12 weeks – also known as the Initial Sales Volume. With the rare exception of a totally new product category launch, regular New Products Launches impact the Sales Volume, Sales Revenue, and Market Share of existing products. The Impact of Product Cannibalization needs to be carefully ascertained for fine-tune planning of existing products and re-allocation of Supply Chain resources. Brand Cannibalization if left unchecked can lead to obsolescence and expiration of existing products leading to financial losses. New Product Launches call for changes and upgrades in existing products and hence it’s important to assess and align the backward Supply Chain to gear up for the Launch. Design changes need to be communicated to Raw Material Suppliers for review and concurrence. New material introduction need to be highlighted in the Raw Material BOM. Any changes in the Manufacturing process needs to be communicated in advance for alignment of resources. Raw Material Supply Capacity and Lead-time needs to be meticulously calculated and finalized. A review of the organization’s internal Manufacturing Capacity of Finished Product is necessary when deciding if the Internal Capacity is sufficient or it needs CapEx or Contract Manufacturing. Short-to-medium term Production Plan of existing products needs to be finalized to help determine existing Capacity Utilization. Capacity Utilization percentage needs to be estimated after approximation of new production requirement, set-ups, and changeovers. Once the sample raw material arrives, conduct test runs to ascertain need for changes in manufacturing process or additional equipment. Review packaging, palleting, storage and transportation requirements. Initial Production Quantity is typically 65-70% of the Initial Sales Volume. Its Production is generally scheduled such that the Products are ready for shipping at the Warehouses at least a week before the official Launch date. However, the percentage of the Initial Production Quantity is dependent on the type of product and business policy – for e.g. products with shorter shelf life can have lesser percentage of production of the Initial Sales Volume. Manufacturing Engineering, R&D, and Quality Teams need to be on the standby during the initial production runs to quickly resolve any unforeseen issues. Initial Production Distribution Plan generally follows the Regional Distribution pattern of similar products or same category products. Inputs from the Regional Sales team and top customers is important before finalizing the Distribution Plan. Distribution Planning involves meticulous considerations to avoid costly and time-consuming repositioning of inventory and trans-shipments. One strategy used by Transportation Managers is to keep maximum inventory up-stream at the Regional Warehouse and then allocate inventory to Distributors and Retailers within the network as Demand unfolds. The first 4 weeks of the New Product Launch Phase is very crucial and needs to be closely and frequently monitored. Direct and frequent interaction with Top Customers, Dealers, and Retailers can help curtail possible product issues down the line. Demand Signals like POS data and Social Media Buzz should be integrated directly with the Supply Chain information network. Staying on top of customer demand and back-order situation is vital for a successful launch. Regular and frequent internal meetings of key stakeholders is advised for quick resolution of any challenges.